Let’s face it – the big star of Julia Pfeiffer Burns State Park is clearly McWay Falls. It’s an easy walk to a jaw-droppingly gorgeous coastal waterfall that draws photographers and tourists from all over the world … but that doesn’t mean the park doesn’t have other gems to offer. 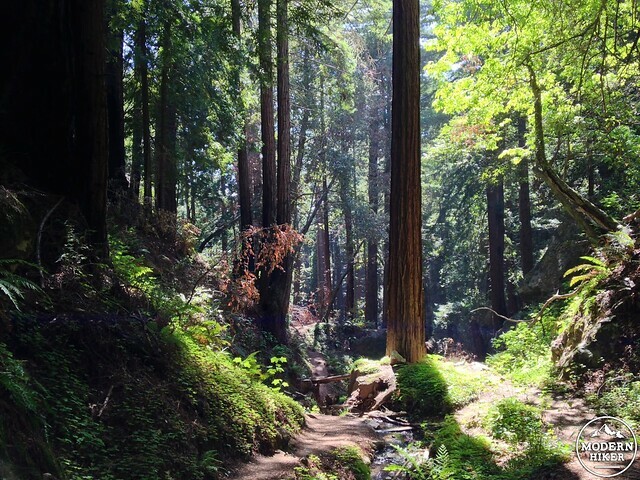 The Ewoldsen Trail is located just a few steps away from the trailhead to McWay Falls and is arguably the best day hike in all of Big Sur. 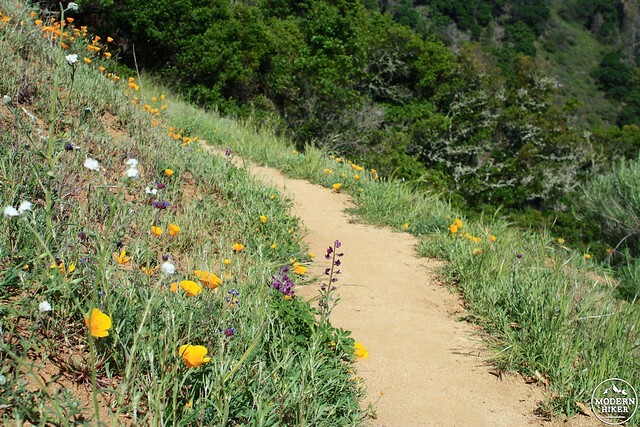 The trail has its own (admittedly not quite as impressive) waterfall, along with thick coastal redwood groves, grassy meadows nestled between ridges, and gorgeous coastal views – and with a challenging incline you won’t find on the McWay route. 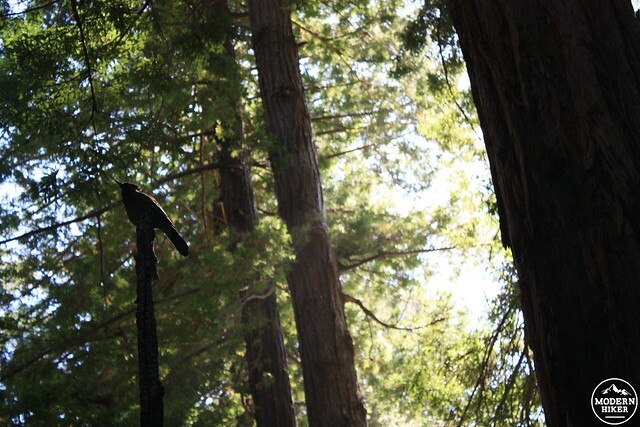 So after your boots are laced and sunscreen and bug spray are applied, head through the small picnic area near the parking lot and almost immediately you’re enveloped by thick, old-growth redwoods. The trail here is mostly flat and very lovely – enjoy this level ground now, because you’re not going to taste a lot of that on this trek. 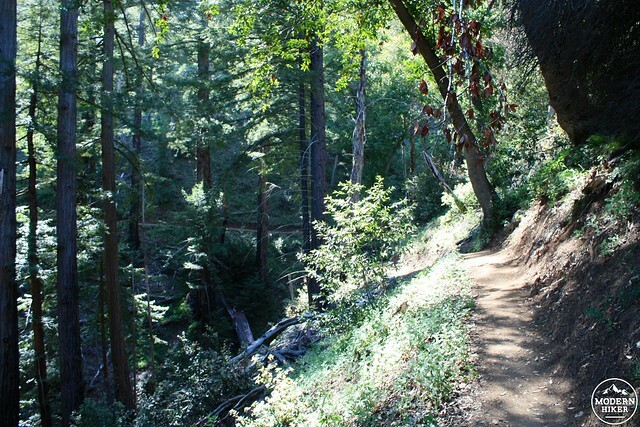 For the first 0.3 miles, the trail follows along McWay Creek through this dense green forest. At the 0.3 mile mark, you’ll see a signed junction with the Canyon Loop. 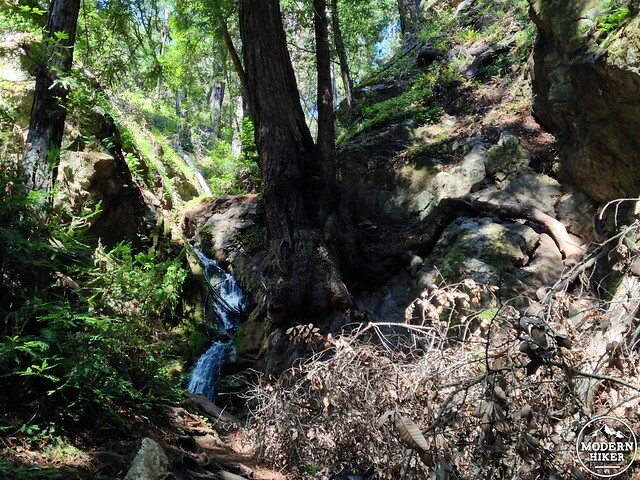 Before you start heading up, stay to the left to continue another tenth of a mile up McWay Canyon to Canyon Falls – a small cascade through forest. It’s a quick side trip and a turnaround point for those who just want to keep their hiking on the Easy Level for the day. Backtrack to the sign when you’re done soaking up the waterfall and get those legs ready for a climb … From here to the next small stretch of flat land, you’ll gain 443 feet in 0.85 miles – and the trail wastes absolutely no time getting started. Just be thankful you’re still in the shade and surrounded by tremendously beautiful scenery. 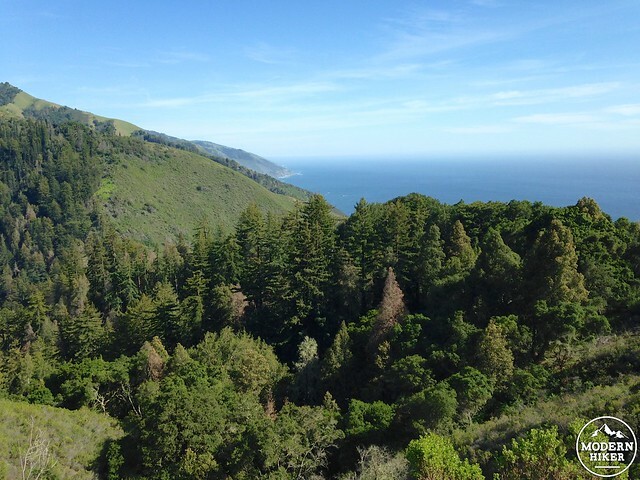 In 2008, a series of wildfires ravaged much of Big Sur and the effects are still visible today. 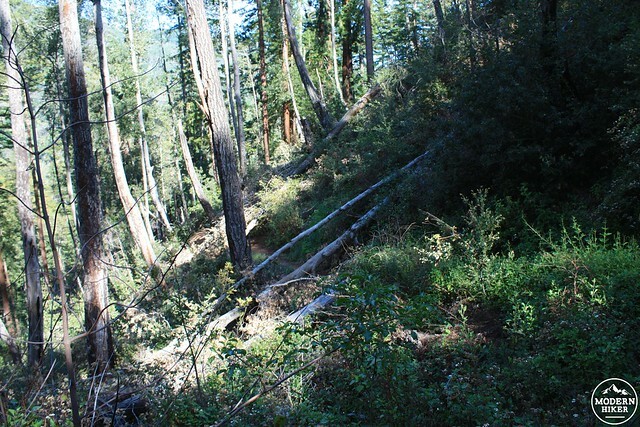 Although most of the trees survived in this part of the region, subsequent rains took their toll on the slopes. There are many portions of this trail that are still rough to follow and you’ll pass a few of them on your way up, here. Nothing is difficult to get through but you may want to stop to take your time around some of the washed out sections and downed trees. 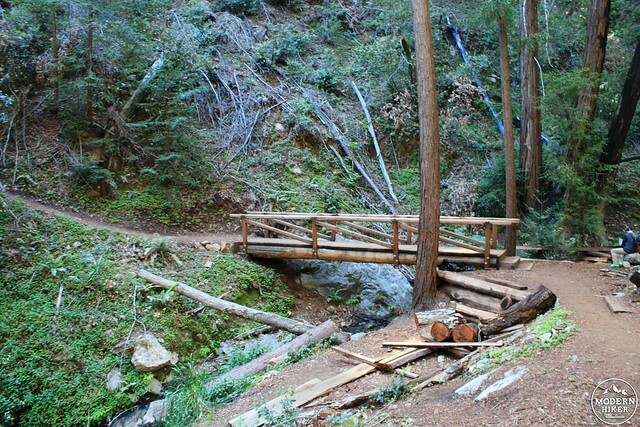 At the 1.4 mile mark, the trail once again crosses McWay Creek on a newly-constructed bridge. 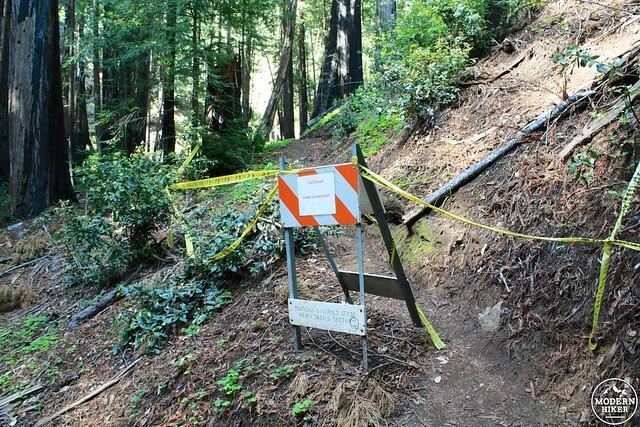 Up until those wildfires, this is where the Ewoldsen Loop Trail splintered, but right now the eastern stretch is closed to hikers, making this an out-and-back instead. Cross the bridge and prepare for – you guessed it – even more incline. 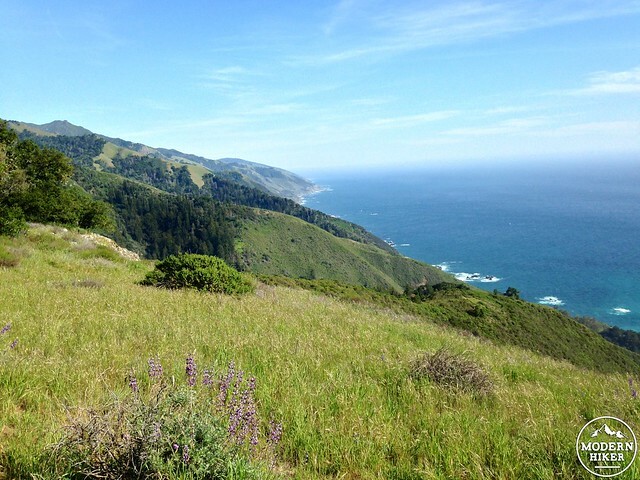 At the 1.85 mile mark, the trail hits a nearly-bare coastal ridge and makes a sharp turn north. Here, you’ll have some very nice views – both west toward the ocean and east toward the higher mountains, including some more visual evidence of those wildfires. 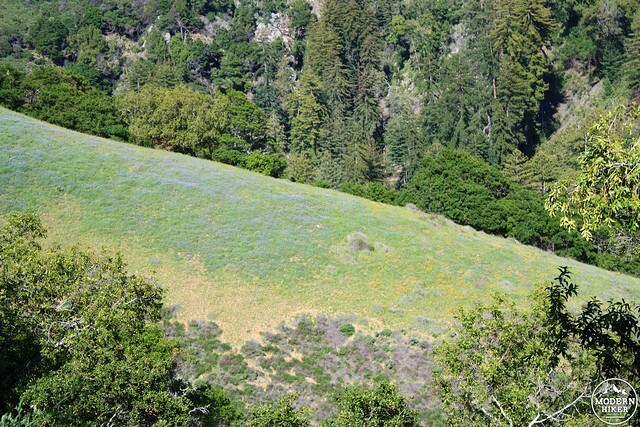 In the spring, you may be lucky enough to spot some of the more open areas covered in wildflowers. From this point to the summit, I found the trail condition deteriorated quite a bit, although it still wasn’t impassible or dangerous. The 0.3 miles from here to the junction with the old loop trail meanders through a section of forest still covering from the burn. There are several downed trees along the trail and some patches of poodle dog brush taking advantage of the weakened ecosystem. 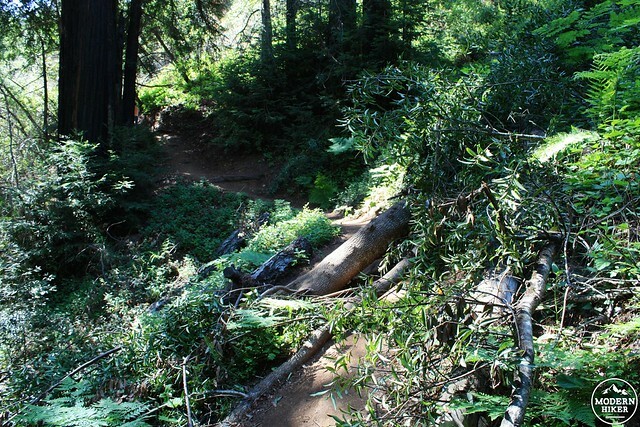 Hopefully in time this area will recover – but until then just watch your arms and legs near the edge of the trail and take it slowly if you have to duck under or climb over any tree trunks. At the 2.6 mile mark, the trail meets up with the closed Eastern Loop and makes a bee-line west, straight up another ridge. 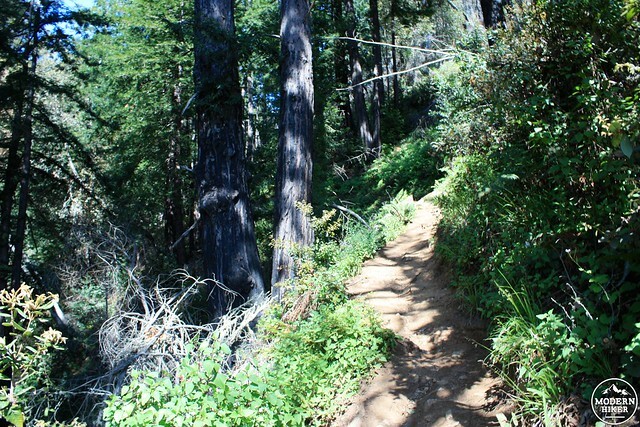 This steep section of trail has loose dirt and is also strewn with debris from the fires … and it’s really not very photogenic, either. 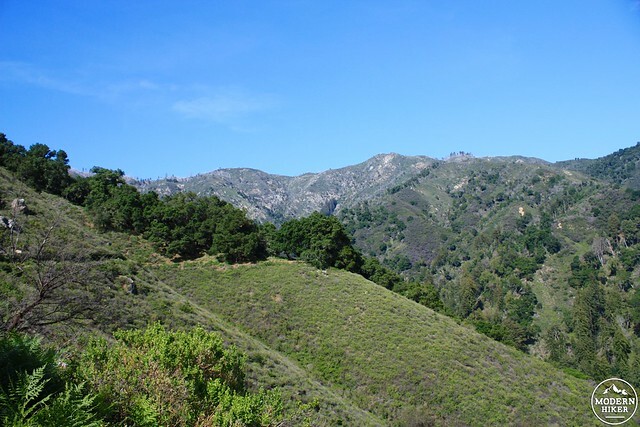 But once you reach the top of the ridge and take a quick left onto the Lookout Trail, all your efforts will be greatly rewarded with a beautiful meadow, wooden bench, and never-ending views of the Pacific Ocean. Soak it all in, have yourself a snack, and then head back down the way you came in. 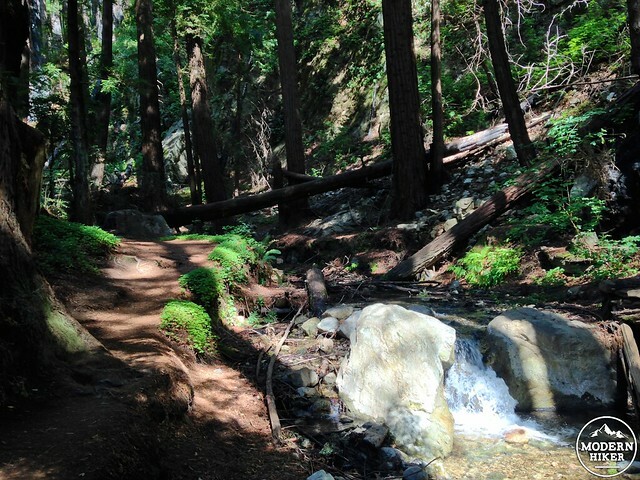 Most of the trail on this route is fine, but the area was heavily damaged from a 2008 wildfire and subsequent erosion. At the time of this writing, the eastern side of the Ewoldsen Loop was completely closed, while the western side was open but with several areas that definitely could use some reconstruction work. 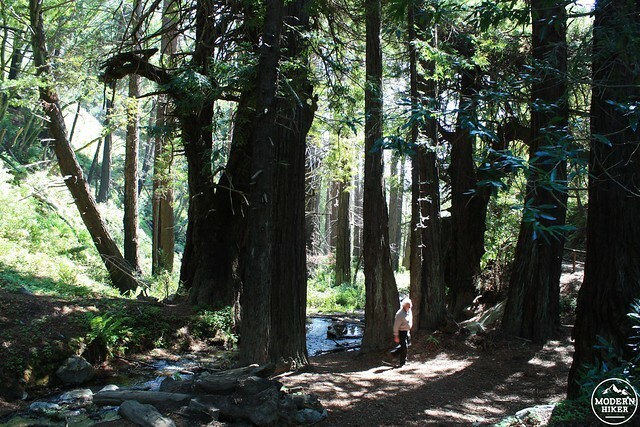 If you can't snag one of the two coveted spots above the waterfall, there are plenty of other camping options at other state parks and National Forest land in the Big Sur region. Julia Pfeiffer Burns State Park is located directly on CA-1, approximately 81.2 miles north of Morro Bay or 38.8 miles south of Carmel. Self-issued entrance passes can be purchased for $10 at the gate (at time of writing). If you can find parking in one of the small lots on CA-1, you don't have to pay the fee. Awesome! Thanks for the advice! 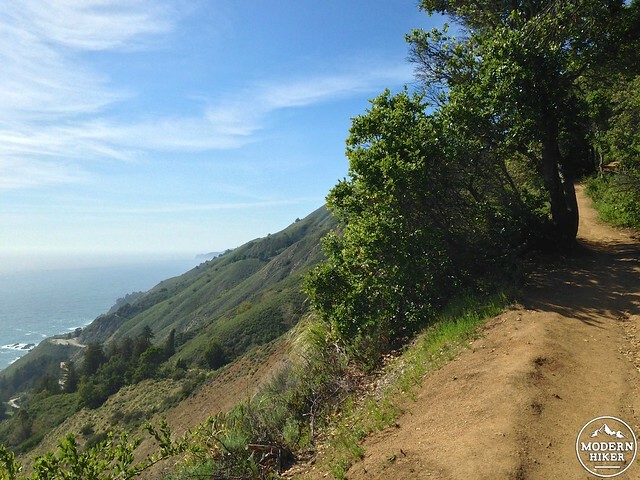 I'm heading up to Big Sur this weekend and plan to do this trail Saturday! Super helpful content, thanks again! Sure can. If you check out the map or the GPX file, you'll see a trail network that continues north along the coastal ridge. You can add as much of that on as you want! Is there anyway to add on to this hike and make the trail longer before turning around?